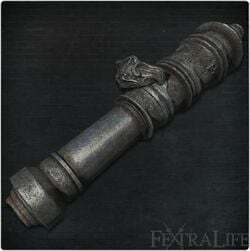 Cannon is a Firearm in Bloodborne; it's one of three strength-based firearms in the game. "Large prototype firearms fashioned by the workshop heretics, the Powder Kegs. Use of this weapon is equivalent to toting a mounted cannon, complete with its ridiculous weight, staggering kick, and lavish use of Quicksilver Bullets, into battle. Such a monstrosity was doomed from the start, and indeed its development was cut short. Yet, against impossibly gigantic foes, it might be just the thing. " The Cannon is one of two firearms in the game that utilizes explosive projectiles. It requires high strength to wield (30), making this primarily for Strength or "Quality" (STR/SKL) builds. This firearm can be useful for opening up visceral attacks against gigantic enemies/bosses, or simply removing a large chunk of their health. As of patch v1.03, it takes 12 QS Bullets to fire. This firearm currently has the highest QS Bullet requirement to fire as well. For this reason, the Cannon is best saved for towering foes or inflicting massive damage against a single target. It should be kept in mind, however, that certain measures can be taken to increase the number of Cannon shots possible during a hunt. The Bloodtinge scaling on this firearm is low, reaching rank D at its highest peak. However, it can still be a worthy choice to invest in Bloodtinge because this firearm's base AR is very high. 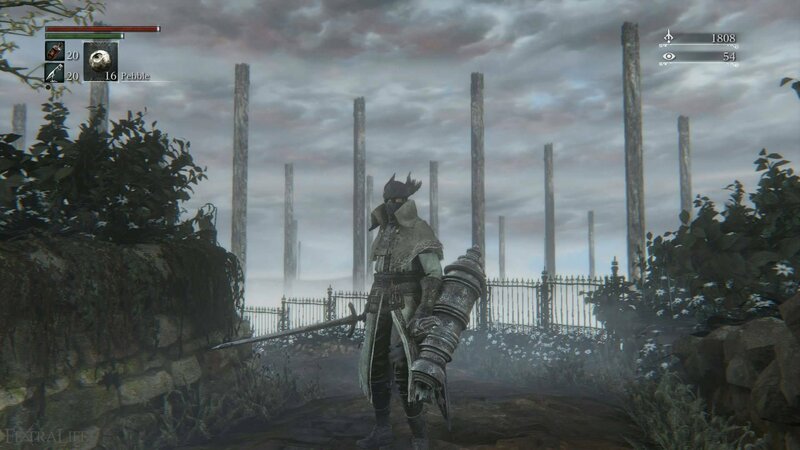 Furthermore, if you own the DLC, you gain access to a weapon that works well with the Cannon, the Bloodletter, as it makes great usage of both strength and bloodtinge. It's found in the Forbidden Woods inside a big wooden building. You need to walk into the building behind the enemy who is firing a large stationary cannon. When you proceed into the building, there will be a Viper Pit Mob guarding the area. Stay above and exit on the opposite end of where you entered. Drop down from the ledge onto the exterior roof. Next, kill the Large Huntsman and go up the ladder. Once back inside the building, follow the narrow wooden walkway to the other side and look for another slightly lower hanging walkway. Drop down and circle around until you find a corpse next a destroyed gear; the Cannon is there, where you can pick it up. As of patch 1.02, it can be obtained without killing any bosses by using the Iosefka Jump to get early access to the Forbidden Woods. You can get a total of 2 shots max with the combined use of Blood Bullets on both shots, which would leave you with 6 bullets remaining. However it is possible to get up to 4 shots if you have all three Formless Oedon runes stacked that you can find outside of the Chalice Dungeons. If you use said three runes (+1, +3 and +4) and Blood Bullets for each shot, you will have none remaining after firing four times. Keep in mind for the Formless Oedon runes that there are two more versions which are found in the Chalice Dungeons: +2 and +5. Alternatively, stacking all three Oedon Writhe allows replenishing shots by successfully landing two or more Visceral Attacks. If you use a firearm or hunter tool to open up a visceral attack, it will require more than two Visceral attacks. However, if you manage to open up Visceral attacks through other means that won't use bullets, then all you need is two Visceral Attacks. 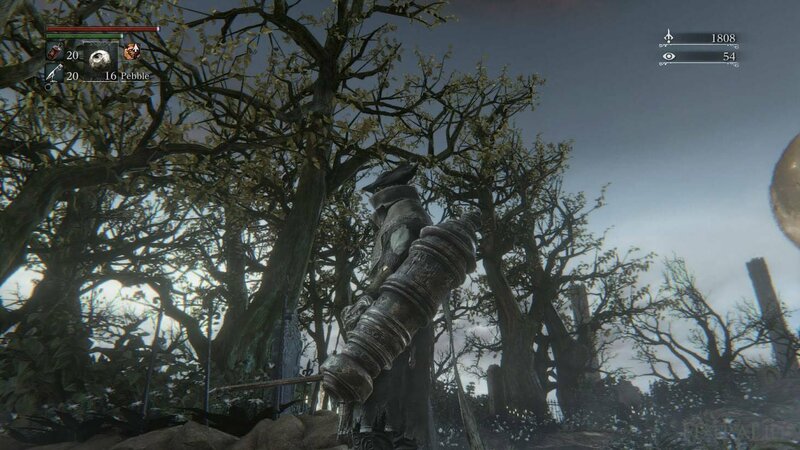 Since you will fire the Cannon a very low number of times per-hunt, using Bone Marrow Ash is suggested to maximize the damage inflicted on foes. In PVP, you can suprise unsuspecting invaders by keeping the Cannon hidden as a secondary firearm. Use a Trick Weapon transformation as a distraction, then immediately press Left on the D-Pad to brandish the Cannon and fire. However, remember this firearm has a very long recovery time; you're vulnerable to an opponent's attack after you fire for a short while. The Cannon's shot creates an AOE blast when it explodes. The damage dealt to foes is reduced if not directly hit by the projectile, but it can still be effective if fighting multiple grouped-up opponents. Keep in mind the Cannon can still miss as it's a single projectile, so be wary of shooting fast targets or enemies that have hyper-armor on one or more of their attacks. The latency when performing co-op can result in many missed shots. The above can also potentially be an issue in PVP. Compared to the Church Cannon, the Cannon's projectile travels straight forward, but it explodes mid-air instead of arcing downward. As a result, the Church Cannon is an overall better choice for clearing out mobs. However, the Cannon is superior for staggering large foes. The Cannon has a foldable barrel, which is a reference to the series "Armored Core," notably the WC-GN230 Back Unit Grenade Cannon carried by Nineball. It's used by a Yahar'Gul Hunter in the Unseen Village. If you don't own the DLC, the Cannon is the only bloodtinge firearm in the game that doesn't have an actual bloodtinge requirement in order to wield it. If you do own the DLC, this is no longer the case as the Gatling Gun doesn't have a bloodtinge requirement to wield it as well. I wish it had a circular gem slot. I know Blood damage gem farming is the bane of existence, but it&apos;d totally make the weapon better. If you use a normal gun during a pvp fight, absolutely NO ONE expects this thing. They think they can just do a few hacks and slashes and win this when BAM! Priceless every time. If you invest in 50 Bloodtinge, farming a 31.5% blood damage blood gem, and bone marrow ash, the Repeating Pistol does only 14 points less damage than the cannon (while both are +10). "With 50 in every stat, a +29% gem, and Bone Marrow Ash my Repeating Pistol +10 does 1171 damage to an Old Yharnem Beast. The Cannon +10 does 1215 damage to the same Old Yharnem Beast in exactly the same circumstancce but for 10 more bullets per shot. With a 31.5% gem, the Repeating Pistol would gain 2.5% more damage, meaning it&apos;s new damage would be 1200-1201 damage while Bone Marrow Ashed. This means the Cannon gains only 14 more damage when at 50 bloodtinge, but for 10 more bullets, so the repeating pistol is the better option." Does it cause more damages when i shoot enemies in their head while in scope-mode? Does it do a real counter on large mob or it&apos;s just when you hit them in a week point like amygdala ? You can fire 4 shots with the cannon if you make Blood Bullets before each shot, since they get used before the regular ones. But don&apos;t forget to use a Blood Vial after you make Blood Bullets so you won&apos;t die. It appears that the cannon in the .gif has a longer barrel and a more streamlined appearance. Is there any currently known reason for this? This weapon is incredibly useful for anything that invests in some STR, as it goes crazy high damage to enemies and players alike regardless of Bloodtinge level since it only goes as high as D scaling and has no BLD requirement either, so it gives you a ranged "ace in the hole" that goes with a lot of builds too. It looks amazing paired up with the Stake Driver. what in the heck is FS thinking? Isn&apos;t this the whole point of quality assurance, and balancing a game? This isn&apos;t Armored Core for goodness sakes - and their isn&apos;t 20 other weapons in its class to choose from! This radically changes the functionality of my character, and for the record I rarely PvP. If I could re-roll my character, that would be one thing... What? Time to start a new character? This cannon in left-hand will be amazing for Guts Build. Can you get to 6 shots by using all formless oedon runes to get 32 base bullets and the blood bullets strat? Why would they change that to 12 bullets? this is useless now without runes AND bloodbullets Why not just change it so it does the same damage to beasts and less to players? Cuz now it&apos;s bad for everything, even PVE!! As someone who has 30/30/30 in STR/SKILL/TINGE The cannon was one of the main pulls for STR builds. Skill build has BOM/Burial/GUN Rapier/SAW spear/Rifle Spear/Threaded Cane (not including quality weapons). STR has Kirkhammer and the cannon and tonitrus. Bloodtinge has Evelyn and Chikage. They should of left the cannon alone, it was a reward for 30 STR stat investment as STR doesn&apos;t have much else going for it without SKill alongside. Does the Cannon have an area of effect like a rocket launcher? Cannon in my left hand, Stake driver in my right, the only thing missing from my hunter now is a pair of boosters in the back and a shoulder mounted gatling gun and missile pod. dont know why people are complaining I love wrecking ppl with this.You can one shot just about any enemy in this game(with bone marrow ash). And great for strength builds. Why From there is a 8 UW(ultimate weapon) that instant kills almost everything at Armored core but here WHYYYYY.